Hi, welcome to our testimonials page. Feel free to send us your comments about our website or products. Wanted to share a testimonial on your product. I have the SGF 11 X 2.5” system with the Street Pro mufflers. They were installed on my 77-1/2 Camaro Z28. They were professionally installed on my car with Hedman Ceramic coated headers and I was told they installed easily. They look great and sound wonderful, not too loud but with enough growl and punch to sound like a muscle car! The shop said they didn’t have a difficult time installing and fit up really nice. Thank you for a great product and great service, I had to call tech a couple of times and they were very helpful. All at a reasonable price. I can send pictures of my car to add to your page if you would like. Install my Pypes System last week, went with 2-1/2" pipes,wo/X-pipe (stock manifolds) and Quiet-Flo Mufflers. Wrestle with pipes a bit, but all in all nice fit. All the hangers fit perfect, however did bust a clamp, recommend using heavier duty clamps on 2-1/2 pipes. Mufflers sound great @ idle, throaty @ throttle and then they quiet out around 45-50 mph. Impressed a few friends that you will be hearing from them real soon.A great product for the money, and very helpful staff. Thanks PY. Well finally got around to getting my new system ( 2.5 inch with X-pipe ) installed on my '70 Judge. I first attempted at home, starting with trying to remove the nuts from the headpipe/ex manifold flange...thinking, if I can crack them loose, the rest I can hacksaw apart. ( I have no torch or compressor, just the worlds best penetrating oil...'Kroil' ). NFW!! Just wasn't happening. Brought it to a nearby muffler shop today hoping they would get it done before this rain front moves in. Flange nuts were as tough as nails to remove...took the guy like 40 minutes with an acetylene torch, and one of the drivers side manifold studs snapped off. Was finally able to blow out ( w/torch ) and drill and re-tap for a 3/8 bolt...a real PIA that took a while in itself. That system musta' been on there since the Ford administration. The system itself mounted up pretty nice, a few adjustments/trims but no banging/bashing/profanity, and the tech thought it went easier than any other aftermarket system he's installed. Used mostly welds, with minimal clamping...just enough to drop it if I ever have to yank the trans and do a clutch or whatever. I couldn't wait to hear the sound. I opted for Street-Pro's thinking they'll approximate the sound of my old system that was on the car when I bought it 5 years ago ( rusty thinning stock full dual with straight glasspack-type mufflers...looked like Cherry Bombs...and crappy compression bent pipes ) as I DID like the sound of my old system. Fired it up and at idle it sounded healthy but with a burble that sounds sorta' like too "late timing" compared to my old system. At idle, I liked the throaty gurgle of my old system better. Blipped the throttle a few times and it sounds mean! I lost my race with the rain but was anxious to road test the system on my way home. ( fortunately, no mud on the roads ). Sounds real good getting on it... and almost quieter than idle. I couldn't properly wring it out without breaking loose in the rain, even in 2nd gear, but the car feels noticeably torquier. One thing about these Street-Pro's: Boy do they resonate the interior at low throttle/low rpm! All in all, a nice well-engineered and beautiful looking and performing system...just choose your mufflers carefully. I installed the 3" Pypes system (w/ X-pipe and 18" Xlerator mufflers) on my '72 LeMans in my driveway last weekend. I expected a full 3" system w/ an X-pipe to be a challenge to get fit properly, but I was pleasantly surprised at how well the system went on. I don't even have any of the joints welded (just using standard clamps) and the system is solid and has no leaks or rattles. Plus, it sounds great. Deep powerful sound without being obnoxious. Highly recommended system! Really like the site. Just bought a 66 tempest that I'll be installing a new exhaust system on soon. Am definetly considering your system. Just had Midas Install Pypes Performance muffler and tail pipes on my 2001 Dodge RAM 2500. It sounds great!!! !, It fit fine, no problems, CHICKS LOVE IT! I just wanted to write and tell you that I am very impressed with the Pype Bombs I bought for my Mustang. I feel you are giving people a good quality exhaust and a very fair price. The sound is awesome and I am looking to buy a set of long tube headers and X-pipe from you. I have told everyone about your product and hope that it will help increase your sales. I would not mind even opening a muffler shop and promoting Pypes. I am that impressed and will not buy any other brand. I use the Pypes 2 1/2 in system with X-Pipe and the Violator mufflers. The violator series muffler is based on their Race Pro, but a little louder. I love it becuase it sounds like a NASCAR monte carlo on the outside and has little to no interior resonance. The kit arrived with clear instructions and the fit/finish was a 12 on a 10 scale. I have had the car looked at by 2 exhaust pros who thought the system was one of the best they had ever seen, and my 383 dyno'd 325 HP at the rear wheel with the full system. So... basicly I wouldn't use anything else. System went in great (besides wrestling with the manifold bolts a little). Looks and sounds good too. I wanted to say thanks for the super fast shipping and great product. I haven't bolted it up yet but the price and shipping were awesome. Nice T-shirt too! I will make sure all of my fellow Mustang owners hear about your products. Thanks again! I recently installed one of your 2-1/2” cross axle muffler systems on my 1970 Camaro SS that I have owned for more than 30 years. I am very impressed with the quality of this system. The installation went well, with the provided instructions being very helpful. I am now considering removing the sound system from the car as I have not used it since I installed the exhaust! The car sounds great! I took a few pictures of the car. Thank you for producing a very fine product. I just wanted to give you some positive feedback on your cat-back exhaust system. After monkeying around with installing two Flowmaster kits in as many weeks, to no avail, I was pleasantly surprised at how well the Pypes kit worked-out. The parts installed quickly, fit well, and exhibited an overall high degree of workmanship and quality. Your product is built from superior materials as compared to the comparably priced Flowmasters and sounds better to boot. As a mechanical engineer and business owner, I can wholly respect what it takes to do it right. It’s nice to see an outfit that has their act together. I recently purchased a header back 2.5" x-change system with the pro-v "mufflers" ( only in name! ) and am totally impressed with the fit , sound, and ease of installation! Everything arrived in excellent condition and utilizing the stainless steel band clamps. I can find no leaks and an increase at idle of 200 rpm. The engine is pulling about 445 hp and this system really woke it up, decreasing ET by 0.3 . I've been to Pontiacs in the Park twice and Norwalk TriPower Nats three times and wondered if these systems worked that well. I am convinced and wish to thank you for an excellent product. Rick Underwood "71 GTO convertible"
Just wanted to drop you a note saying I am one super satisfied customer. This past weekend I installed a set of 2.5" Pypes w/ X-pipe and Race Pro mufflers on my '70 Nova. I really didn't know what to expect from the exhaust when I started the car, but the sound was sweet music to my ears. And the performance boost was quite impressive as well! Lately I've been feeling as if the car was a bit of a dog, but with the new Pypes on there, it seems to have woken from its slumber. I got plenty of looks driving my little beast throughout the neighborhood during my victory lap aka test drive. Thanks for an awesome exhaust! I installed the 3" Pypes tailpipes on my existing system. I found the tailpipes to be very adaptable. They were actually easier to install than I expected! Thanks PY. Hello, just bought a mid-muffler system for a 2008 Mustang GT. Am about 75% through the install, but can't get the RH Tailpipe to mate with any hangers. I have two hangers supplied by Dallas Mustang where I purchased the system, and the factory hangers. What do I need to do to get that RH tailpipe hung?? Hey, got it fixed, worked out great! Sounds great also. Everything went well until my jackstand failed and the car fell on me. Now as well as having a great sounding 2008 Mustang GT, I have a cracked shoulder blade, dislocated shoulder, and bruised ribs. ;-) All worth it though, - chicks dig scars! Thanks for getting back with me. Hello, I was checking out the gallery before I bought my X-pype system, and noticed there weren't any G bodies with the GN style tail pipes, so I said hey I'll send in my pics. I really like how the tail pipes look, and how nice the exhaust tucks up under. You can't even really see any of it from the side, besides the cutouts, and for how low they hang I'm surprised how hard you have to look to even see them. But anyways the system fit pretty nicely, was kind of tricky getting the X pipe on and getting everything adjusted and fitted good, but we got it. It sounds nice, with the street pro mufflers, nice and quiet, going more for the sleeper effect. I put cutouts on my exhaust, right after the headers, for fun and to try out at the track. Thanks for giving me the chance to submit pics. Oh yeah my car info if you want it is a 1983 Monte Carlo with a GMPP 350 HO 330 horse crate motor, and I have dynomax ceramic coated headers on it. Just installed my new pypes 2 1/2 Xchange system with dumps. I picked up 3 tenths or more with this exhaust!. Maybe with a little traction 12s are possible now. I am still grining. Nothing like uncorking the exhaust and unleashing hell! Here is my Timeslip: (Was running 13.6/13.7 at 99/100mph prior to installing this system) R/T....503 60'....2.039 330....5.542 1/8....8.504 MPH....82.41 1000...11.090 1/4....13.291 MPH....102.74 Thanks again to Pypes for a quality product. My name is Mike Capenegro and I own a 1992 low 11 secound Mustang 331 stroker and I have had Flowmaster 2 chamber 40 series American thunder cat-back exhaust for the last 10 years. Yesterday I installed your Pypes Violator Cat-back exhaust I bought from Jegs and I must say I could not be more happy with your product. The exhaust sounds twice times as mean as Flowmasters at idle and three times as mean under WOT. The best part is during hwy. crusing there is no Droning sound, it's actually quieter on the highway in 5th gear. It also feels like I have picked up some power to the wheels also and I will dyno soon and make a new youtube video also. Once again I just wanted to say thank you for making a great product. you can look me up on youtube "1992 ford mustang 331 stroker" 35 thousand people loved the way my old exhaust sounds, lets see how they like the NEW exhaust. I installed a PY 3 inch system on my 1979 T/A with a mild 462 that is race only. The ET did not change at all from the previous setup which was open headers with extensions. This system flows well. Fit and finish was excellent; no fitment problems at all with the install. A very nice system. Beware that the 14 inch xcelerators are pretty loud if you want to run on the street. Last winter I installed a Pypes 2.5 inch cross over and Pypes tail pipes with turn downs on my '66 Skylark with a 455. I hate to say I used "other" mufflers as I was familiar with their sound and could pic them up locally. With the Pypes hardware the installation was painless. Last year with headers and the stock 2" exhaust with no name mufflers I ran a best of 12.98 @101 with a one time 1.74 60 ft. This year even though I couldn't get my 60 ft below a 1.84, I still ran a 12.78 @ 106. If I can get my 60 ft back I'll have picked up over 2 tenths with just the exhaust and a switch from 3.08 to 3.42 gears. I have to say I'm pretty happy. My name is Matthew Hurt and I have a ’06 Mustang GT that’s sporting a set of your long tube headers, high flow cat, x-pipe, and Pype Bomb axle backs. I did have a set of Violators prior to the release of the Pype Bomb. Anyway I just wanted to let you know that I love this system. I have the Shaker 1000 in my Mustang but anymore I prefer to listen to exhaust rumble. I did the entire installation myself in my driveway in one day. At first I went with the off road x-pipe but later spliced in a set of your high flow cats. I did that in order to bring the sound down enough to keep me from getting unwanted law-enforcement attention. All in all the installation was very straight forward with no surprises. I got myself this car as a reward after a tour in Iraq, and I’ve been adding mods here and there every since I bought it. I am now in the save-up mode for either a wheel/tire package or some body parts. When I got the Pype Bombs you guys had included a cap in the box and I like it. Is there any way to get you guys to send me a Pypes Shirt? Thanks for your time and once again you guys make a killer system that’s music to my ears. I was not sure what to expect from the new Pypes system, but after 4 years of wittling my times down from mid 17's to 14.2x's, I was hoping to get into the 13.9x's. I was completely shocked with my first run, right off the trailer of a 13.505 @ 104.11mph!!! That is an ET improvement of <.747> and an MPH improvement of 5.19!! I saw your add in High Performance Pontiac Mag. and checked out your site. I must say it's a great site, very informative. I read in your guest book about the system installed on Jim Wrangers 67 Firebird, and it seems to be what Im looking for on my 67 Firebird as well. Wanted to let all concerned know that my 3" tailPypes are all installed & look extremely great! As mine were one of the first prototype sets, they did require a little moification(s), but this was expected. With the changes recommended to Chris @ PY implemented these will be the standard for 3" tailpipes for F bodies! Been looking for a cat back for my 02 Mustang GT for a bit now. Didn't want to put on what every other Mustang owner seems to have, and I found a Mustang shop online running a special on a Pypes system. I got it on my car last night and have to say I am thoroughly impressed with the quality, the fit, and most of all the sound! Thanks Pypes! VERY pleased to say the least! I have the full 3" system with x-pipe and Goerlich mufflers out the rear on my 67 GTO. The guys at the muffler shop said it was the best fitting pre-bent kit they had done (and they have done a lot) and the cost can't be beat! Thank you Stacey. You (and your company) have earned my repeat business. I am working on two other restoration projects and I am very pleased with the level of professionalism from your customer service and the outstanding quality of the products. I hope that you can show (publish) this e-mail as a customer testimonial. Drove down to Hatfield,PA (PYPES) today to offer up my 65 GTO as a prototype for a splitter install using the complete 2.5' exhaust system.While the splitters that are available are more like those used for the 72 GTO,they are more than passable given the performance benefits.I was very pleased with the results.Chris and his associates took a number of pictures/sound and measurements(where to cut) of the installation and hopefully they'll be on their website soon, so that you can judge whether this is the suitable setup for your purposes.I went with the xChange system and the ProV mufflers.I might add that during the drive back to CT (2hrs) I noticed very little interior decibel count but I assure you the other drivers heard me coming! Thanks again to Chris and the PY staff for facilitating the trip and special thanks to Mike "the artiste" Zimmerman for the thoughtful installation. Hi Chris.. just thought you might want to know my results after the 2.5 inch xpipe/splitter installation. This was on my 65 GTO convertible that I brought down to you in early February. Remember, it was the car with the standard log manifolds. RWHP	RW Torque Before	251	351 After	313.45	401.5 Cutouts	320.55	407.27 Now, before you get too excited, I did rejet the tripower because they were running too rich, but nevertheless I believe you can attribute at least half the gain from the new exhaust. I’ll be running the car in F.A.S.T. class at Musclepalooza/Lebanon on May 27th but the true performance test will be at Englishtown on June 11th to compare with my last run there (14.01 @ 99mph). Will let you know the results. I have A 2012 Mustang GT & I'm writting to let you know how happy I am with your product. I have installed a complete Pypes Super System with your SS X-pipe, cats & Pypes long tube SS headers. With the addition of JLT carbon fiber CAI, SCT hand held tuner, & custom tuned by Adam Browne owner of Revolution Automotive. The car now makes 417.84 RWHP & 395.05 Max Torque. Pretty impressive with just a few mods. A while back I contacted Pypes for guidance on the exhaust system I should put in the 1968 GTO I am restoring. I had specific sound levels and tones I was looking for and wanted it to be quiet enough inside to enjoy cruising. I just wanted to send a huge THANK YOU to all of you at Pypes!!! The suggestions I got from your sales staff on the exterior sound and cabin resonance was perfect. I ordered the header back 2.5" system with the crossover and Street Pro mufflers to go behind the Doug's headers I put on. I could not be happier with the sound I am getting.....it is exactly what I wanted. Behind the car it has a deep throaty tone and when I give it some gas it sounds really mean but not obnoxious. I also wanted to make sure that the sound wasn't deafening inside the vehicle and it isn't at all, with the windows down cruising at 60-70mph it is quiet enough to easily carry on a conversation. To finish off the system I put the Pypes angle cut tips on and they look fabulous. Thank you for a great product and the guidance to get the exact sound I was looking for. I just purchased your narrow cross-over kit, 2-1/2" mandrel bent tailpipes and a pair of Flowmasters. I have a 1969 Mustang Mach 1 with Hedman Elite headers, TCP subframe connectors and a TCP X-cage and expected to have to do some massaging for a good fit but I was WRONG! About a 2" trim off the front tubes of your cross-over kit and everything fit PERFECTLY-right up the tunnel. INCREDIBLE ! I'll send some pics when I get it up in the air. You guys rock! Installed a set of 3" Mandrel tails on my '66 Bonneville and they really helped give that look and tone I was looking for. Car already sounded great with the dumps at the mufflers (Flowmaster 40s) but the tails gave it that true Flowmaster sound I was looking for. Great fit and great quality. My installer said he had never seen such well made and easy to install pre-made pieces. I Just wanted to let you all know at Pypes Exhaust that you are one of the most informative, professional and helpful companies I have dealt with. I bought an XFM23 Off road X-Pipe with the SFM60VS Violator mufflers. It took less than 2 hours for my wife (yes my Wife) and I to raise the car in the driveway and unbolt and install the x-pipe and mufflers. I had Flowmasters previously and they do not compare to the throaty roar I have now. Here is a pic of my Stang and my video is coming soon. You have my business from now on, so come out with some other accessories. Stacey was a tremendous help on the live chat too so I have to give her props! Thanks!!!! I was among the first to try the 2 1/2" downpipes for standard log manifolds. I was very pleased with their fit along with the rest of the X-pipe system. The whole system went on with out any problems and only took a few hours in my garage by myself. The PY Quitone mufflers give the car a nice agressive sound without being overly loud. I'd recommend a PY system to anyone without hesitation. Chris, I bought your 3" X system for my 73 Super Duty Trans Am, I installed it myself at home in a afternoon, the hardest part was cutting the old flowmaster system off! The only thing I would like to see is more groung clearnce, but with the 3" X you are going to have to live with the car's design limitations. The cool part was how much I picked up in the 1/4 almost 4 tenths!! my old system was a 2 1/2" so that does explain some of it. Anyway thanks again for a great product at a great price, Jeff. Hello, my SFM66 mid-muffler system for my GT Mustang arrived today. I just got through installing them myself in the driveway. The installation was a breeze. I finally got the sound I have been looking for. I have tried many different after market axle back muffler sets on it and was disappointed with the sound of all of them. To this day, I can't figure out why they mounted the muffler on the end. Any muffler needs a tail pipe. It must just be one of Fords better ideas. THANKS PYPES!!! I bought your Monte Carlo full system from headers back and used the SGG-3" system with X pipe and PVR13S reducers then added the Race Pro mufflers. The motor was pro built at a speed shop here in Tulsa, Ok and the 454 was punched out 30 and a stroker crank with 9.8-1 pistons and comp 240 duration cam. It made 562 ft lbs of torque and 550 hp at 5800 rpm. I have it in the body shop getting painted now. The system sounds super, better than I ever expected and sounds like an Indy Car sound. I got them from Jegs and installed them myself and all went very smooth. Here is the video of the 86 Monte SS after the New Pypes system was installed. Went back to the track this weekend and set a new personal best. Only thing changed since last time is a new Pypes exhaust. I just finished the Pypes exhaust install on my 1968 Mustang hardtop. Install was time consuming, but it came out great. I tig welded all the joints and used Dynatech V clamps on the muffler to tailpipe connections for easy disassembly. The street pro mufflers sound great. I had F brand mufflers before and had a terrible drone inside the car. That has been eliminated now, and the car is much more enjoyable to drive. Finally I got the sound I was looking for. 2007 Shelby GT came w/ FRPP mufflers, changed last year to Pypes Violator, changed last weekend to Pype Bombs. This is what the Shelby should sound like. Makes all the difference. Highly recommend to all Mustang GT owners. Simple installation. Installed Pype Bombs myself with no problems. Very satisfied. Saw your ad in the August edition of MM&FF. Was thrilled that I might find a good exhaust, x-pipe set up, for my 2004 Mustang Cobra for under $400. Nice website, good information, and sound files, but if I could make a suggestion, adding a search tab so people can locate a system by their vehicle and year would be very helpful. Keep up the good work! PYPES ROCK !!! Ive got the three inch system with ultraflow welded mufflers the car sounds mean when you are on it but its quiet under normal driving. System works and fits !! I just finished installing the Violator Mufflers on my 08 Mustang GT. Love the sound. Thank you for your tech assist. I am 63 years old and installed them my self. However by having my head stuck you know where, I encountered some problems, after two call to your tech assist, the installation went flawlessly. And your guys didn't even laugh at me. Kit went on great! I just wished my '65 Nova ran so that I could hear how it sounds!! Thanks for the great price and even better service. I couldnt be happier. I would recommend Pypes to anyone. Just finished installation of your 3 inch x-pipe system w/18" XLelerators on my 72 Chevelle 468". Sounds much better than the prior 2.5 Flowmaster system.Tailpipe clearance was unbeleivable. Can't wait to compare ET with open header times (11.86-114 mph). Thanks again. I just got a header back 2.5 inch exhaust for my 1979 trans am. This system has given my motor 20 more horse power than with my chocking 2.25 inch from flow master. The install took me 3 hours to do because I like to take my time with things. Seeing that I am only 16 years old. The car has a great aggressive sound under acceleration , and a calm throaty sound at idle. Thanks for the system Pypes!!!! Hope to do more business in the future. My name is Chris, and I just wanted to thank you for making such a high quality product. I won one of your Street Pro complete systems for my 1979 Trans Am 3 years ago at Pontiac Heaven in Arizona. The system held up very well and was a very easy installation. I had a few issues with people driving the car and bottoming it out, but recently, my girlfriend drove it and managed to rip half of the system out of the car... Instead of salvaging it, I decided to go ahead and purchase an entire new system. I got the Violator complete system for the same car, and will be installing it Saturday morning. I just want you to know, you have a customer for life, and I have turned my friends to your products as well after they saw how well it worked on my car. No complaints at all, and I really am glad that someone finally got it right! There is something cool about having a unique exhaust sound that is not heard every day. It gets old hearing flowmaster 40 series on a camaro 24/7. The Pypes systems have their own unique sound, and depending on what cam is in the car, it sounds different for everybody. Thank You again so much for building this product. It really has revolutionized the exhaust system market in whole. 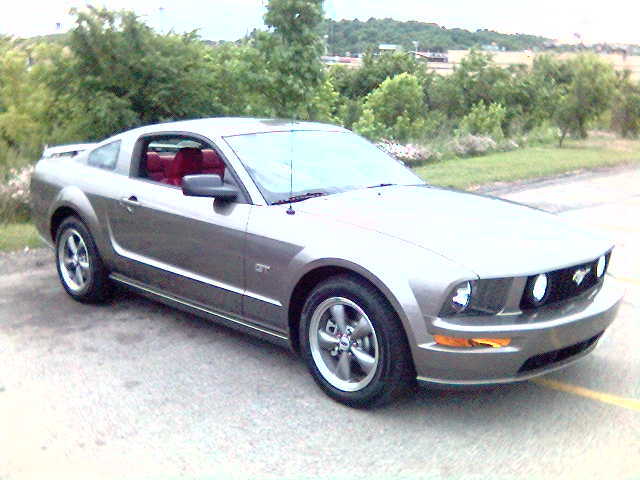 This is my 2005 Mustang GT that I bought brand new. The car has only 4K miles on it and has never seen rain or snow. I was going to keep it stock but the aftermarket bug bit me and now I have a hood scoop being preped for paint and I installed a Pypes Violator axle back system on it this week. The Pypes system was a very simple bolt on proceedure that took less than an hour and man what a diference the Pypes system makes. The car has a very very deep and mellow exhaust note especially in the lower RPM range when cruising around or in traffic. Open it up and run the 5 speed through the gears and that deep mellow tone turns into a crisp bark that send chills through you. I am really impressed with the product and the price couldn't be beat. I'll recommend Pypes exhaust to any Mustang owner out there. Get a set and enjoy. Pypes has a great product in the SGF70 exhaust system. I puchased this 2-1/2 inch stainless steel cross flow system with the race pro muffler along with the manifold downpipes and the polished exhaust tips for my 1970 Z28 Camaro. The system installed beautifully, fitting very close to the body. The sound is excellent while being quiet inside the car. Performance improvements were impressive. Quarter mile times decreased from 14.1 to 13.6 and mph increased from 98.5 to 102.9. The only change to the car was the exhaust system. Way to go Pypes! Hey Chris. I got the 3" exhaust on the car & it sounds great. X-pipe fit with only minor modifications. Hey, a really nice site! Really impressive. 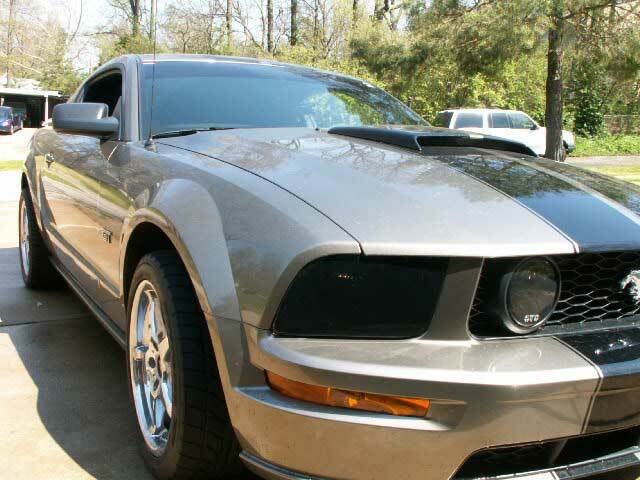 We just completed a transformation from mild to wild on Deby's 2006 Mustang V6. We selected a Roush body kit with a Steeda Cowl Induction hood and added a custom Tangerine paint job. It was important that we find the correct exhaust system to work with the Roush Rear Valance. After doing a lot of research on different exhaust systems we decided to go with the Pypes SFM65 'True Dual' system with a set of take off Roush mufflers we purchased on eBay and the Roush tips made to fit the Roush Rear Valance. The exhaust system was installed today and we couldn't be happier with the results. Please see the attached pictures. We are very happy with the Pypes exhaust system and would love to see these pictures posted on the install gallery section of your website. Thanks for allowing me to Test the standard head pipes for the Firebirds 70-81. The whole kit was easy to install and well thought out. One can install it in their driveway! Check out the Performance Years Forums where Blackcat has pix of the installation. Installed the 3" system with the X-pipe and 18" Goerlich mufflers. Installation wasn't that big a deal. The tailpipes were the worst part. I welded the entire exhaust so I don't have any of the clamps showing. Fits really well considering these cars were never meant to run a full 3" exhaust. Can't wait to finish the rest of the car so I can hear it! I can't beleive how easy it was to install the Pypes Mopar kit on my 1970 Plymouth Roadrunner. After removing the old exhaust, the Pypes system was installed within two hours. The only modifications were cutting 2 1/2 inches off the left side front pipe that connects to the header and adding 10 inches of straight pipe just before the mufflers on both sides. The system sounds awsome. I replaced a 2" header back dual exhaust system with a 3" Pypes system with an X pipe and Violator mufflers. I have been delaying this for a long time because of the expense. With no other changes I picked up 5 mph at the 1/8 and 1/4. Best quarter mile time went from 14.3 to 13.3. I finally broke the 100 mph barrier (from 98.3 to 104.5 mph) that has been eluding me for two years. This is meant to be an encouragement for people unsatisfied with restrictive exhaust systems. Go on and DO IT! A good exhaust system is worth every penny. Can you tell I'm happy? I just bought my violator cat back from you and all is can say is WOW. The install only took me 45 mins. I just wanted to say thanks and give you a couple vids. Volume: Anything louder would be annoying for a daily driver. It is just at that volume "limit". Cold start-up is loud, but it settles down nicely. WOT volume is excellent. The other system I had was not different enough from stock to make it worth it. However this system really makes a BIG difference without annoying you or your neighbors. Tone: The tone is less refined then some other systems. If you are looking for "smooth" and "refined" tone, this is not it! If you want something a little more raspy an old-school, but still "deep", this system is perfect for you. Online videos do not do this system justice!!!! Much better in person. Drone: There is some drone at around 1800-1900 rpm under light load, but it goes away quickly after that. Do not let this discourage you from buying this system!!!! I was very worried too, but am so glade I tried this system. It is more than livable on a daily driver. Unlike another system I had, when inside the car, this system reminds you that you are driving a performance car. I have honestly found myself turning the radio off just to listen to the car when driving around town. Fit: Initial installation is very quick (an hour tops), but the adjusting to get it perfectly straight and centered in the rear bumper cut-outs was absolutely horrible!!! Especially because of the 4-inch tips that don't leave much room for error. I am extremely picky about stuff like this so it took me forever to get it perfect. Keep everything loose until you get right. Use a lift if you have access to one. The passenger-side muffler will need lots of work to get it far enough from the gas tank. Perfect fitment is possible as I have it now, but it took lots of patience to get it. Value: In short, for the price, this system is absolutely amazing. The tone is less refined and more old-school, but that's what I wanted. The loudness is just at the limit for a daily driver. I am EXTREMELY SATISFIED!!! I hope this helps someone who's trying to make a decision! I have the 2 1/2 inch PYPES system with the X pipe in my '69 Firebird convertible. The system fits great. I am using the same Dynomax Race Magnum 2 1/2 inch mufflers I had with the old 2 1/2 inch H system. The new system has superior ground clearance and is much quieter than the old system. I can actually hear my stereo and hold a conversation while driving. The sound is awesome...deep and throaty but a humble rumble at idle. The performance is excellent as well. The PYPES system has made my car far more enjoyable to drive! Thank you Performance Years!